AI-Hunter™ leverages Zeek/Bro and RITA to collect packet information from your network and analyze the results. 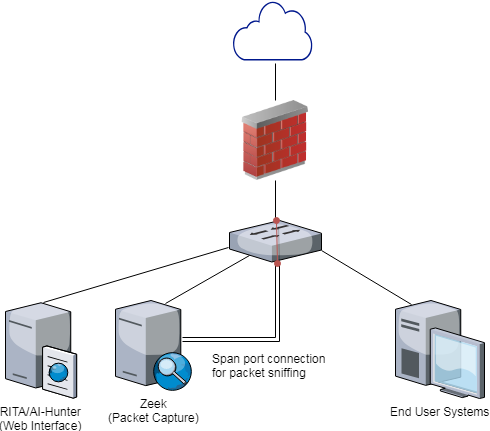 Zeek/Bro runs on a single system and connects to a span port just inside your firewall. The AI-Hunter™/RITA system can be located anywhere on your internal network provided it has connectivity to the Zeek/Bro system. If you have multiple connections to the Internet, you can run multiple Zeek/Bro systems or sensors, all feeding data back to the same RITA/AI-Hunter™ Web Interface. Contact Black Hills Information Security and find out more here.